Sir Marc Aurel Stein, KCIE, FBA (Hungarian: Stein Márk Aurél) (26 November 1862 – 26 October 1943) was a Hungarian-British archaeologist, primarily known for his explorations and archaeological discoveries in Central Asia. He was also a professor at Indian universities. Stein was also an ethnographer, geographer, linguist and surveyor. His collection of books and manuscripts taken from Dunhuang caves is important for the study of the history of Central Asia and the art and literature of Buddhism. He wrote several volumes on his expeditions and discoveries which include Ancient Khotan, Serindia and Innermost Asia. 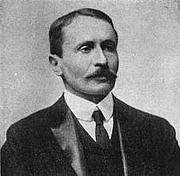 Aurel Stein is currently considered a "single author." If one or more works are by a distinct, homonymous authors, go ahead and split the author. Aurel Stein is composed of 12 names. You can examine and separate out names.